ARC GIVEAWAY on The Midnight Garden blog! 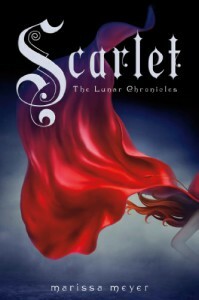 Title: ScarletAuthor: Marissa MeyerRating: 4 out of 5 starsRelease Date: February 5th, 2013 by Feiwel & FriendsAge Group: Young AdultSource: ARC provided by the publisherI read the first in the Lunar Chronicles, Cinder, just last week, and was enamored with Marissa Meyer’s imaginative and wholly original take on the Cinderella fairy tale (seriously, who gets sci-fi/fantasy with cyborgs and aliens and magic powers from that? 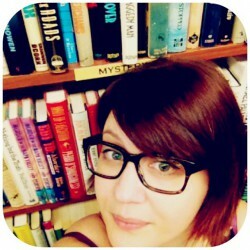 SOMEONE AWESOME, obviously), and very much enjoyed the depth and humor she infused into the characters. But, there was still something missing for me. Some indefinable piece that could bump it up from, “wow, this is really great” to, “TELL ME MORE. IMMEDIATELY.”I’m pleased to tell you, my friends, Scarlet is that missing piece . With its higher stakes, intense action, and one hell of a big, (so hot it might be) bad (for your heart) Wolf, I couldn’t turn the pages fast enough.The sequel picks up right where Cinder left off, but from Scarlet’s point of view. She, as you might have imagined, is a red-headed, red-hoodie-wearing French girl, who is desperately searching for her Grand-mére, Michelle Benoit, who disappeared without a trace two weeks before. She meets Wolf, a curiously shy street fighter, and finds he may know what happened to her grandmother. Though she suspects him, she has no other leads, and no choice but to agree to his offer of help. Meanwhile, Cinder is breaking her way out of prison in New Beijing, with a new companion in tow--the cocky “Captain” Thorne, who has a stolen ship hidden on the outskirts of the city. Narrowly escaping capture, they fly to France in search of Michelle Benoit and the answers Cinder hopes she will be able to provide about her past. What follows is a fast-paced, gritty, and surprisingly violent climax that doesn’t let up until the very last page. I felt almost out of breath while reading, cringing and tensing as though I was experiencing every scene right along with the characters.The dynamics between the characters are great. Cinder and Thorne’s snarking back and forth was hilarious, but the real star for me was the slow, simmering build between Scarlet and Wolf. Marissa Meyer knows how to write some swoony UST (unresolved sexual tension), and I was all a-flutter over Wolf from the very first page. He’s quiet and sweet, but with an edge of just barely restrained violence that I have to say, really worked for me. (And it didn’t hurt that this:is what I pictured while reading. Right? I know. )Like Cinder, the main flaw I found in Scarlet was predictability, but in this the pacing was so well done I found it didn’t matter if I knew what was coming, the way in which I arrived was exciting enough to keep me on the edge of my seat. It ends with no real cliffhanger (just a seriously swoony scene), but with a sense of urgency that will keep me counting the days until Cress, the third book in the series, is out in 2014.